All sparkling wine starts life as still wine and has the sparkle added later. One of the crucial factors in the quality of every sparkling wine is how the fizz is added. By the Champagne method, the carbon dioxide gas produced as part of the fermentation process (as yeasts devour sugar) is dissolved within the wine in its individual bottle, so that when it is released, the bubbles stream to the surface. Champagne is France’s most northerly Appellation Contrôlée area, lying 90 miles Northeast of Paris.In truth, if the wines from the region were not sparkling, Champagne would hardly figure on the world wine map: the climate is such that grapes struggle to ripen and the basic wines that are produced are often pretty thin and acidic.The earth here is composed of deep layers of chalk. This climate and soil is very similar to the Southeast of England, which many people believe has the potential to make sparkling wines of Champagne quality. The Montagne de Reims isn’t really a mountain as such, more a hillside, but its slopes do accommodate some of the best vineyard sites in the Champagne region. The Côtes de Blancs grows mostly Chardonnay, and the Aube, 100 miles further south, grows mostly Pinot Noir. You will recognise the first two grape varieties as Burgundy’s famous duo. Pinot Meunier is another black grape and a relative of Pinot Noir. It is a vital constituent in most blends, but is generally regarded as the lesser of the three varieties. Though not as common, there are also Champagnes labelled “Blanc de Blancs” which are made only from Chardonnay whilst bottles labelled “Blanc de Noirs” are made from either or both of the black grapes. All 300 or so Champagne villages scattered around the district are rated for the grape quality potential, and the top 17 are designated as Grand Cru vineyards. The best known of these are Bouzy, Aÿ, Sillery and Le Mesnil. The luxury Champagnes usually contain a higher proportion of grapes from these vineyards, though there is no such thing as a “Grand Cru” classification for bottled Champagne itself. Having made a high quality, if acidic, dry white wine, it is placed into special heavyweight bottles and a fresh dose of yeast and sugar is added. The bottles are then capped and placed in the cool chalk cellars of the winery for a minimum of one and a half years. During this time, secondary fermentation takes place. CO2 is created by the fermentation process and with no means of escape, dissolves into the liquid. The problem with this technique is the deposit of dead yeast cells that collects in the bottle. In still wines these would simply be filtered out, but since that would also remove the bubbles, another method had to be found. This process is known as Remuage: each bottle has its position gradually adjusted so that over the course of a few weeks the bottle goes from horizontal to upside-down. The dead yeast cells are captured in the neck of the bottle. Many houses still employ a highly skilled Remueur, who can adjust 40,000 bottles per day, controlling each one precisely. Others have installed less romantic, but just as effective, computer-controlled machines to do the job. At this stage the inverted bottles are carefully transported to a tank of freezing brine solution. The necks are dipped in, just to the level of the gathered sediment, which freezes into a solid “plug” of dead yeast cells. The caps are removed and the gas pressure shoots the plug out. The bottles are topped up with a “dosage” of reserved wine, sweetened according to the desired style of wine (dry, medium or sweet). The bottles are corked, wired and at that stage the Champagne is complete. As stated above, the base wine for Champagne is thin and very, very acidic, but this is not to say that it is a poor quality wine: only the best grapes and the most gentle pressing will result in fine, pure base wine that will make the finest Champagne. 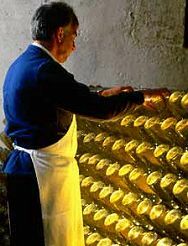 It is after the addition of the second dose of yeast and sugar, as the wines lie in the cool chalk cellars, that Champagne begins to fill-out and transform. This is wine that is kept for a minimum of 18 months Sur Lie, gaining weight and complexity from the lees on which it is sitting and adding yeasty, toasty, biscuity flavours. (the same process that adds weight and complexity to the otherwise tart white wines of Muscadet). Doux – sweet, dessert style Champagne. Blanc de Blancs – made only from Chardonnay. Usually fruity, creamy and elegant. Blanc de Noirs – Made only from the two Pinots. Punchy, full-bodied. Rosé – often made by blending some still red wine into Champagne. * Blending is one of the keys to Champagne’s consistency in terms of taste and quality. NV wines will often be a blend of all 3 permitted grapes unless otherwise stated. These wines are made for immediate consumption, though many will benefit from further ageing. ** Not every year is declared as a vintage year, and vintage Champagne is only made if conditions are good enough. These wines are usually considerably more complex than NV Champagnes and are capable of further development if cellared. These super-expensive vintage Champagnes are to a certain extent statement wines, marketed and bought as “luxury goods” as much as fine wines. Given that they can cost two or three times as much as fine vintage Champagnes it is debatable whether they represent good value, but they can be extraordinarily good. The De-luxe Cuvées are usually made with grapes from Grand Cru vineyards and are always suitable for cellaring. Champagne houses whose non-vintage and vintage wines I have really enjoyed include: Veuve Clicquot, Pol Roger, Charles Heidsieck, Billecart-Salmon, Laurent-Perrier and Louis Roederer. Of the De-luxe Cuvées, I would splash out most readily for Dom Pérignon, Pol Roger “Cuvée Winston Churchill”, Krug “Grande Cuvée” and Laurent-Perrier “Cuvée Grand Siècle”. The biggest change to the Champagne region in the 21st century is the rise of ‘grower Champagnes’. Historically Champagne was a region where farmers grew the grapes, but then sold these exclusively to big houses who made the wines. Perhaps not surprisingly given the price obtained for a kilo of grapes as against a bottle of Champagne, more and more growers have begun to bottle their own wines, often of extremely high quality, and for many people representing the most interesting Champagnes of all. This phenomenon has led to higher prices for those who still sell their grapes, and to Champagne houses becoming more likely to acquire their own vineyards too. Bouzy Rouge (from the Grand Cru vineyards of Bouzy) is probably the most widely known still wine of the region. A Pinot Noir, it is lighter in style than the Pinots of Burgundy and is made for early drinking, but it can be very fine. This and most still wines of the region are within the Coteaux Champenoise Appellation Contrôlée (AC Champagne is reserved for the sparkling wines). The rarely seen Rosé des Riceys AC covers Pinot Noirs from the most southerly Champagne vineyards of the Aube. Many of us are now as familiar with New World sparkling wines as we are with Champagne. For a long time the Champagne houses fought a rearguard action against those making quality sparkling wines by the traditional method, fighting legal battles on many fronts to stop anyone stepping into their territory. The house of Mumm was one of the first to break ranks. With a philosophy of “if you can’t beat them, join them” they set up a sparkling wine operation in California in the ’80s to make a sparkling wine by the traditional method that would compete directly with its own Champagnes – but rather that than sit back and watch the New World steal an important share of their market. Nowadays most of the great Champagne houses have outposts in California, Australia, New Zealand, often South America and South Africa too. As well as that, quality sparkling wine is being produced by New World houses, that many people believe is as good, at least at the blended, non-vintage level.